Description: Another PAC-MAN. This was cool paint scheme. Description: This westbound was idling without a crew in the siding between Portage and Wisconsin Dells, but never moved in the 2+ hours we spent further west up the line. Description: Humboldt One slows around the curve at 35th Ave while a Z train on the BNSF gets recrewed. Description: A CP GP38, CP GP40, and Soo GP38-2 lead 580 into Winona. Description: And a hockeystick to go with it! Title: CP rail GP9 in St Paul in 2009. Description: This unit is used the cold Canadian weather that has decended on the La Crosse area! Description: SOO 4434 and CP 3017 pulling SOO 117 at Hastings. Description: Power outside the roundhouse. 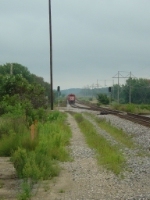 Description: CP train #580 arrives in La Crosse WI. Description: Wayfreight #580 enters La Crosse Yard to put their train away and tie up for the day. Description: Four EMD's and an ECO with train H-19. Description: Roster view of the unit as it sat idling but unmanned in Humbolt Yard on St. Patrick's Day 2014.